This method uses a moving sensor. 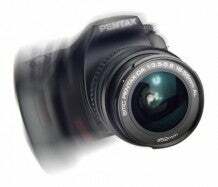 Quite logically, as camera instability-induced blur is created by the image moving across the face of the image sensor, an alternative to manipulating the lens optics to compensate for the shifting image is to move the image sensor itself. This is moving sensor image stabilisation. The basic mechanism is much the same as Optical IS. A real time feedback loop connected to gyroscopic motion sensors triggers actuators that move the stabilisation element, in this case the sensor instead of part of the lens optics, and shifts the sensor to keep the shifting image stationary from the point of view of the surface of the sensor. Moving sensor IS was developed specifically for digital still cameras and early adopters were Ricoh and Minolta, the latter, with its partner, Konica, introducing the world’s first moving sensor IS system for a digital SLR. 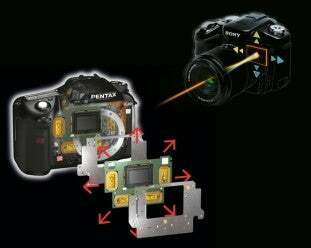 Now, Pentax, Samsung, Sony (which took over the Konica Minolta technology), and Olympus have developed their own moving sensor IS systems for DSLRs, while Nikon, Olympus, Casio and Ricoh use moving sensor IS in selected compact digital still camera models. In theory, a moving sensor system has some apparent advantages over OIS systems. The sensor moves in a two-dimensional plane, so the lens optics aren’t compromised. If you have a DSLR with a moving sensor, you can apply the benefit of IS to any lens, so avoiding the price premium and limited choice of interchangeable IS lenses. Some DSLR manufacturers also claim that by vibrating the sensor, dust can be shaken off. In practice, this has yet to be verified – it seems dust removal needs a more sophisticated kind of sensor vibration to be effective. In reality, moving-sensor IS has its own limitations. For example, if the sensor captures an image in an extremely shifted position, more of the image will lie near the optically less-ideal perimeter of the lens’ projected image circle. It has also been suggested that there is less correction latitude compared with OIS systems, partly because the gyro sensors are positioned in the camera body, the least sensitive part of a camera, especially when fitted with a long telephoto lens. Moving-sensor IS systems need to know the focal length of the lens to operate efficiently and this means older, non-CPU lenses, may not work properly. The sequence on the left was taken on an Olympus E510 that features moving sensor-based Image Stabilisation. The camera was fitted with an Olympus 70-200mm lens. Shots were taken at varying shutter speeds with the IS switched on, then again with it off. Electronic Image Stabilisation, or EIS, was, again, developed for video cameras, initially as a lower cost alternative to Optical Image Stabilisation or where space constraints ruled out an optical solution. Today, EIS in still digital cameras encompasses several different approaches to image stabilisation. The original EIS type of system attempts to visually stabilise a shaking picture by dynamically altering the electronic framing of the scene. The benefit of EIS for digital still cameras is not significant. Sometimes this dynamic framing is controlled by gyro sensors, but usually, to keep costs down, the system monitors the scene itself and relies on areas of the scene to act as markers for framing stability. Although this can work well enough with video footage, artefacts introduced by the required image processing, plus the fact that blur is not physically compensated for, means that the benefit of this kind of EIS for digital still cameras is not significant. But non-mechanical means can be successfully used to artificially boost the sensor sensitivity and so, speed up the shutter to minimise the effects of both camera shake and subject movement. Boosting sensitivity is a compromise, though, because the price paid in quality is additional noise graininess and often compressed dynamic range, leading to over-dark shadows and blown out highlights. But in the end, this may be a price worth paying. Some companies, most notably Fujifilm, have been very succesful in reducing noise at high ISOs to provide a viable high quality alternative to IS. It’s now also increasingly common to find sensitivity-boosting image stabilisation complementing moving sensor or optical systems, too.